Archives of Eaton Bray News for August 2012. Don't miss this night of nostalgia as it will be the last one that Peter will be giving. All proceeds from this event will go into the funds for the new Eaton Bray village sign. This week saw the Sunday eleven travel to the civil parish of Bridens Camp to play Great Gaddesden who they had beaten comfortably just weeks before. A beautiful setting awaited the team on a glorious day. The Crown and Sceptre pub teased the players with the promise of a rewarding pint, but only after a match had taken place. The Great Gaddesden skipper won the toss against the trumpeting JMc and elected to bat. Peacock jr. was not present at the toss, instead taking up residence in the away team toilet as the previous night's antics took effect! GG Openers Hill and Bolton proved a challenge early as rapid-fire scoring commenced. Opening bowlers Tickell and Roff bowled well, but with a quick outfield, runs were readily available. Hill picked up his 50 before being bowled by Cee-lo Green. Bolton went to the Sunday veteran Ian Jones for 27 caught behind by a sore headed Mcdermid. Captain Cheeseman came in and played his shots before being expertly caught by a half-asleep Jones at square leg off the bowling of the colourful Peacock.R! 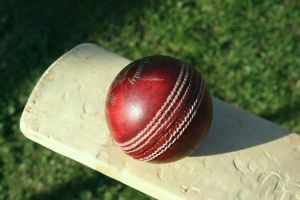 Barm had stated that the ball moved at the speed of light, which in turn, made an incision in his finger, prompting talk of a potential hospital trip, which skip Peacock cruelly rejected. In strolled number 4 Plummer, with a selection of powerfully struck shots which the Bray bowlers had no answer to, as he went on his merry way to 117 not out. It wasn't all doom and gloom as Ollie Sirett picked up 3 fantastic wickets to build on his 2 wicket haul in his previous outing the week before. The Bray opened their innings with the brothers Peacock. Josh set about his task quickly and began to send the ball to the boundary with some classy shot-making. He approached 50 as his brother looked to support by pushing runs in to gaps and rotating strike. Ryan's aerobic ability was being severely tested as the younger, fitter brother almost finished him off with some energetic running between the wickets as Bray kept up with the run-rate, which was being matched as a partnership of 100 came up from 12 overs. The two continued in the same fashion seeing the partnership go past the 150 mark. Josh made his century a few balls on but was undone as he attempted a 6 over cow, caught on the boundary by the oppo's centurion. He was heard remarking "I'm rubbish at slogging" as he walked off, which is probably true! The opening stand ceased at 154. At this point Bray were on for chasing the 274 total, although the next three batsman came and went without mustering many runs. They did however, importantly support Ryan as he went on to score his Maiden 50. Those in attendance were quickly reaching for tissues as his bat was raised. Tickell came in and attacked hitting 15 from 5 balls before falling to Cheeseman who quickly accounted for Ollie's old man John and "Pro" Green. With the sun setting on Bray's chances, the tail came and went without wagging. Ryan was still there at the close on 74*. A truly good game of cricket played in the right way, in Caribbean-like temperatures!! Designed to commemorate the Queens Diamond Jubilee 2012, it is a shield based on the Bray family's Coat of Arms and depicts scenes from Eaton Brays past. It is topped off with a crown as a mark of respect for Her Majesty Queen Elizabeth the Second in her Diamond Jubilee year. In the top left hand side is an image of the last Manor House in Eaton Park which was pulled down circa 1790. Before this, there had previously been a Manor House of Sir Reginald Bray that had been built on the site of the castle of William Cantelupe which stood here in 1221 surrounded by the moats. Top right is St. Marys Parish Church, a 13th century example of Parish Church craftsmanship with magnificent arcades built with local Totternhoe stone (clunch). A 13th century font survives as does the famous Thomas-De-Leighton door hinge. A short walk back to the church you will find a brief history and guide book on sale and your chance to bide-a-while in this historic place of worship. Centre is the War Memorial with the names of the local lads who gave their all for us in the two World Wars. Dedicated in July 1923 by S. Howard Whitbread. Lower left, shows a device for breaking down Hemp (Flax) for the making of rope. It was used as a symbol by the Bray family known as "the Hemp Bray" or Brake. Lower right. A device called a Plait Mill, it was used to flatten the plait much like a mangle. Our village was once famous for its straw plait, indeed, I doubt it could have survived in the 18th and 19th centuries without it. Straw was plaited into lengths of 20 yards – or a "score" as it was known, and sold to the hat manufacturers in Luton. The Chevron shown here comes from the Coat of Arms of the Bray Family (seen below on the post). Lower centre. Moat Farm in the High Street. Once the home of the Henley's, they were one of the larger duck breeders in the village. It was said that you could smell the ducks as you came down Lancot Hill. The Henley's also manufactured bricks and tiles form the area now covered by bungalows in Church Lane. The clay dug in these pits contains no iron and as a result the bricks produced were a yellow colour. There are plenty about in the village, see if you can spot them. The Bray Coat of Arms. The shield is divided by a chevron and depicts three Eagles feet showing their claws. These were said to be "armed", that is to say the Brays were fighting men or Knights. We know that Reginald Bray was fighting at Bosworth Field as it was reputed to be he who found the fallen crown on a thorn bush and handed it to Lord Stanley who, in turn, placed it upon the head of Henry Tudor, Earl of Richmond proclaiming him Henry V11 in 1485. Five weeks later Reginald was knighted by the king, and granted the manor of Eyton for his services, hence the modern name Eaton Bray. Lower right. Carnations represent W.E.Wallace and Son Ltd. one time Eaton Bray's largest employers. Starting up in Eaton Bray in 1886, they went from strength to strength producing thousands of blooms a day right up to the mid 1970's. The range of colours was wide and included numerous varieties that were grown only by this company. Some of the names live on like Wivelsfield, Northcliffe. Coral and Saffron Rise as road names on the Wallace Drive Estate. Lower left. Prunes, this unique variety of plums grow only on the Vale of Aylesbury from Hockliffe in the north to Western Turville. All the villages in between grew the crop and on a good year could fetch £80 per ton. A small orchard could produce enough fruit in a season that, when sold, would pay the rent on a cottage for a year. Would you like to be a Poppy Appeal collector in Eaton Bray this coming November?We already have a brilliant team of house to house collectors in Eaton Bray, but we need a few more to replace those who have moved etc. It means going out and door knocking for a designated road or small area, either in the evening or on a Saturday during daylight. It can be cold and wet in November, so warm waterproof clothes are sometimes essential. A thick skin can help too - we know a few houses where nobody answers when Poppy Appeal collectors knock! If you'd like to join the team, please contact us. 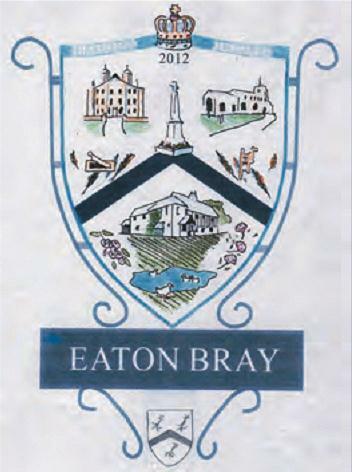 Eaton Bray Cricket Club urgently require players of any age and ability to join its successful club. a Sunday XI, where the emphasis is on developing young and inexperienced players. We run a varied social calendar as well! A highly successful youth system has been running for the last 2 years and the club is going from strength to strength. In order for us to continue the development, more players, young and old are very welcome to come down and join any of the men's or youth teams! Please contact us via the EBCC website for any further information or pop down on a Friday net session at the ground - The Rye Eaton Bray next to the garden centre. After losing the Andy Holloway Memorial match for the first time in 4 years last week, Bray were looking to get back to winning ways against the team with definately the best teas this side of Europe, Hawridge and Cholsbury CC. With only 1 Bray player hungover, things were looking rosy for the home side. Losing the toss, Bray were put into bat, which made things easier for the home skip who admitted he didn't know what to do if he won it anyway! Opening bowler Cath made it a poor start removing Jasper and Furby early on, before Drew and Jacamo steadied things with a partnership of 77 before both fell in quick succession for 48 and 34 respectively. "Sicknote" Holbrook added a very well played 22 before a collapse ensued, with Del Boy, Harv, Rhino and Bieber all falling quickly, which left Cee-lo Green and Mr Eaton Bray to try and get Bray up to a decent score. Unfortunately Green promptly forgot to use his bat and padded up to a straight one, leaving Bray 151 all out, being probably 30 or 40 less than was looking likely earlier in the innings. A lovely tea rightly followed, although dining alfresco became a necessity as Del attempted to blow holes in the pavilion with some absolutely nasty farting, one spectator did comment "I think I actually swallowed that one". Barm and Rhino also mentioned it was a shame HCCC didn't bring any of their catering delights with them and so it was out to the field with 7 out of 11 Bray players wearing designer blue sunscreen, Ollie "Bieber" Sirett leading the way with nose, lips, cheeks and forehead covered. HCCC openers Robinson and White started proceedings by smashing the bowling of openers Harv and Ronnie Round-Arm to all parts, as White brought up a rapid fifty, apparently on the back of 150 score the day previous, but the introduction of Barack in tandem with Drew Peacock changed the game somewhat as the scoring rate slowed and Barm began to digest his way through the middle order taking an impressive 2-10 from his 6 overs. The rapid start unfortunately meant that it was a case of when and not if HCCC were going to knock the runs off, although an impressive spell of 1-20 off 7 overs from "Cee-lo /Dai /Prof" Greene did delay things further. In doing this, Justin Bieber fan and lookalike Ollie Sirett was brought on to terrorise oppo batsmen and bowled magnificently, keeping the ball full and straight, being the undoing of Drane, stumped by Alden and then also opener Robinson who edged behind to begin wild celebrations. However, Harv obviously wished to have a beer and a cheeky sing-song after the game, so bowled a rank long-hop which was smashed for 4 and followed up with a wide to get things over and done with as HCCC got to their target with just over 6 overs to go. It was left to Bieber fever to take hold with Sirett being carried off the pitch on the shoulders of Rhino and Harvester. Shower banter, a jug from Ollie (he's starting young!! ), karaoke from both teams and some late night strip catching practice followed, rounding off a very fun, although not at all successful weekend for the Bray!! Location: High Street, Eaton Bray. Date and Time: The offence took place between 00:30am and 08:00am on 3 August. Crime Reference: J D / 2 6 9 7 8 / 2012. Residents are being asked to review the security of all doors and windows, after a burglary took place in High Street, Eaton Bray. The offender has entered the property by unknown means. A tidy search has been made and a purse, wallet, keys and phone have all been removed from the kitchen. Make sure that the front of the house is in clear view from the street. Check that side gates are locked. Keep bins, ladders and garden furniture locked away. A radio set to a talking channel will give the impression that someone is in the house. The Eaton Bray Sunday Superstars travelled to Ley Hill CC on Sunday deep in the Chiltern Hills. It was the first time the two sides had met, and on arrival it was found that rain had dampened what is a beautiful village ground. With a boundary one side that was short enough for Barm to hit the keeper's gloves from the rope and with a golf tee no further than 40 yards from the square, it was building up to be a very interesting match! Bray welcomed under 14 player Aaron Gauntlett into the side, along with his recently transferred brother Lee. Sawdust manager / kit clerk / all-round cricketing enthusiast Fil Davies was also present. To the cricket, and Bray won the toss choosing to field, with the match reduced to 35 overs per side and Hemming and Gauntlett junior warming up ready to open the bowling. Both bowlers bowled well and Aaron found some bounce throughout his spell, but with the boundary a sneeze away, runs were piling up. Aaron did break through in the 8th over having Pieterson jr caught expertly down the leg-side by keeper Del. A further rain shower ensued, enabling Barm to gawp at the women swimming in the Olympics, which quickly passed and Bray headed back out with more sawdust provided by Filipe Flop and beer towels at the ready. Harv and Barm bowled long spellls each, to no avail, with some toe-end chips to the short boundary ever accelerating the score. However, in order to make up for a terrible dolly drop in the 2nd over, Harv expertly run-out both number 1 and 4 batsman with two direct hits in to give Bray a sigh of relief before the rain returned once more. It was here that the game was reduced again to 27 overs a side. To finish things James "Pro" Green and the skip grabbed a cheeky wicket each at the end. Courtesy of opener Pieterson sr. and number 3 Nadeem's (sort of) brutal innings, LHCC closed on score of 197-5, which on a normal sized ground would have probably been around 150. A lovely tea followed, with hot onion bhajis and mint sauce on the menu (Jake Barker wouldn't have left the table) and the Bray went out to smash their way to victory. It must be said that oppo skip Pieterson jr. must be a huge fan of Douglas Jardine, considering his bowlers pitched 90% of their balls in their half of the wicket. Bray made a steady start as the Ley bowlers used the bounce in the wicket to good effect. Both players then made a plan to hit their way through the short-stuff with both playing their shots, until Parrott strangely left a straight ball and headed to the pavilion for 12. Alden carried on the way he had, picking off runs until he was bowled for 20. It left Peacock and Gauntlett sr. to have a go with both piling runs up from some continuing short bowling. Both were going well, (26* and 30* respectively), but with a get-able 87 required off 9 overs and sloggers Harv, Del and Davies ready to club a few sixes, the rain returned to dash any hopes of a result and the exciting finish that was round the corner. You are viewing the August 2012 archive.